Pictured above is the weed-choked, north-end of my Woodland Garden. This is a damp, shady area where common white vinegar — my favorite weed-killer for full-sun situations — would have little effect. I’d pull the growth by hand, but without some kind of suppressant, more weeds would appear in short order. But newspaper — applied thickly — will smother those weeds for an entire season. The paper will also keep any buried weed seeds from germinating. This technique, which I call “Newspaper Mulching,” is very easy to do. First, lay newspaper over the weeds. Be sure to apply it thickly, as shown. I don’t worry about black-print versus colored-print. Why? Because these days, all newspapers use non-toxic pigments. 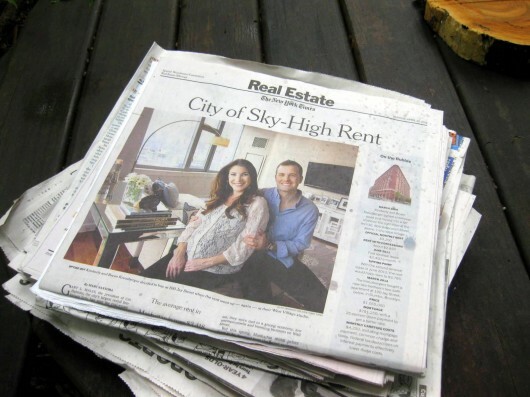 Even the glossy pages are coated with a non-toxic, biodegradable material. Of course, a big wind will kick up just as you start to work. To keep the pages from blowing away, spray them with water. Damp paper stays in place. Finally, cover the newsprint with 2-3 inches of mulch. I mulch with shredded leaves because I have a stock pile of them. Composted wood chips make a fine mulch, too. In my experience, newspaper makes a better weed-suppressant than regular mulch alone. The paper blocks out the light that plants need for photosynthesis (the conversion of sunlight into sugar). But water can penetrate the paper, which means worms and other soil organisms are not compromised in any way. As a matter of fact, newspaper feeds the soil. Worms eat the decomposing material, and then release it as nutrient-rich matter in their castings. Worm-castings are nature’s soil-conditioner. You can plant right away in a bed that’s been newspaper-mulched. Simply plunge a trowel through the paper to make a hole (damp newspaper cuts very easily). Then plant your seedlings. Newspaper mulching has been my salvation on many occasions. One spring, the raised beds in my Herb Garden became choked with weeds just when I wished to plant my crops. So I simply laid down the paper and mulch, made small cuts in the paper, and then planted away. That summer, not one weed pushed its way through the paper-barrier. 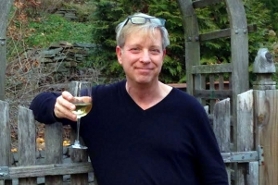 A wise journalist once proclaimed “Old news is no news.” But if you’re a gardener who hates to pull weeds, you will find, as I have, that old news is great news! Nice to meet you, beetree! I have done this!!! I’ve used very thin unprinted brown cardboard successfully too!!!! 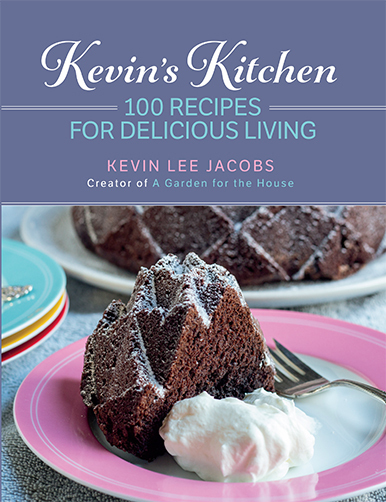 Well done Kevin! I am following this suggestion for a newly planted hydrangea garden and understand that weeds should be suppressed for this year. What should I do for years 2, 3, 4, etc.? This ounds great. I wish I had known it before I mulched all my beds. Definitely I will try next year. Thank you Kevin for the tip. And the one about milking the roses. I will try that too if I get black spots. Thanks Kevin! What a great way to recycle too! I just tried this trick in a large area that we only grow mulch(and weeds). To shady for anything else so we just put bark mulch down. Ran out of newspaper for a portion of it but needed to continue putting down the mulch. Will be interesting to see how the newspaper vs. the non-newspaper section does with weeds. Thanks Kevin. You have so many great tips, and this one reminded me that my Dad put papers all around his tomato plants to supress the weeds and keep in the moisture during those hot KY summers. Have tried the lasagne approach to gardening? I have a bed right now that I am going to do this in. I was thinking cardboard, but that would be tough to maneuver around the plants. Newspaper will work great!! If I put these newspapers down this year, will it cause all my tulips, daffodils, and other spring flowers to NOT be able to come up next spring? I am afraid it will drown them out or maybe the paper will be disingrated enough by next year? The vinegar works great for me on some areas and weeds. Thanks for all your great tips and postings. Have yet to try the english muffins, haven’t gotten any molds yet. I have a “rose garden” that I put in a couple of years ago and it is filled with a nasty weed which I think is some kind of violet but it spreads everywhere!! I will try the newspaper mulching as described above and hopefully reclaim the bed for roses. Thanks! We have used this method for many years with perfect success. Occasionally we find ourselves with a surplus of cardboard and that works well, too. Though, I prefer to run the cardboard thru the shredder to use as bedding for the vermiculture. I’d learned of this process many, many years ago, but haven’t yet tried it. I’ve been raking a lot of the areas with weeds and of course to hand weed is abusive to the joints so this will be a nice alternative for larger areas. Just wondering though if Spring bulbs will die from this process? Haven’t heard of the vinegar solution to sunny areas but wonder if it would work on my many brick walks and patio without harming the ants, worms and burrowing bees? Thanks! I have used newspaper mulch very successfully!! I lay it along my tomatoes and cover with hay or straw. It decomposes by the next year, and i till it back into the soil. My question is…if you use white vinegar for weed control, what strength does it need to be? the 5 % solution from the grocery store is not strong enough, right??? Regular household vinegar worked quite well for grass and weeds coming up in the driveway cracks. Will have to again as more are starting. Took 24 hrs and most were wilted. Thanks for the newspaper reminder. I was wondering how to stop weeds and grasses coming up between my rubber brick pavers. Now all I have to do is pick them up, newspaper sections down and pavers back in place. Problem solved for the rest of the summer. The vinegar works really well. I tell all my customers about it all the time. I buy it by the gallon at the grocery store. I just pour it on straight with a water bottle, not opened up all the way, so it drips slowly. I apply it right to the roots, and within an hour, the plant is dead. I haven’t tried it in a sprayer yet. I suppose that would make the task quicker. For anyone that does try the vinegar, be aware that it changes the acidity of the soil as it is an acid. Aloha from Maui! Those little heart shaped leaves don’t look so much like weeds to me. They look like what I’ve been told is the wild herb Gotu Kola. If you look in Wikipedia under centella asiatica you’ll see a nearly identical picture to yours and the article gives info on both culinary and medicinal uses for it. It also makes the sweetist little purple and white flowers if you let it. I would say let it be and maybe harvest it for your own use. One man’s weed is another’s delicious cure! Hi, Kevin – I’ve used newspapers for years and find it works very well. Same with the vinegar. This year I bough a hand sprayer to make it a bit easier. I’ll let you know how that works. I find that the vinegar trick needs to be done on a regular basis to keep all the weeds at bay. Much easier than hand weeding or using something scary. Thanks.. If only you had run this last week. My fingers are still sore from 5 hours of pulling seedling with tough roots. Next time!!! Thanks for the great tip. Victoria- a weed is any plant growing where you don’t want it to grow. But I’m with you, always look and see if you can use it as is or transplant before killing it off. Kevin- thanks for the format with great info and to all the followers who share their expertise and concerns, thanks. I get answers without asking the questions. I’ve been using newspaper and grass clippings or leaves on top for years. I can really tell a difference in my soil for the better. Works great under the tomato plants to keep dirt from splashing up onto the plants when it rains. Then I just till it under the next spring….newspaper is totally decomposed by then. Helps to retain the moisture in the soil as well. Believe or not, I heard about using newspaper years back and put it down under my window area about 7 years ago when we did some planting of shrubs/ red-rock etc. I have not had any weeds in 7 years in that particular area. Every year I keep wondering if I might have to re-do that area again, and so far, no problem. Newspapers really do work!!! My name is Lori. Your website is beautiful and so informative. I am really enjoying it. My husband and I recently set up our first raised bed garden, it’s small a 4×4. We used your tips about laying down cardboard or newspaper first and filling the bed with a mixture of topsoil, sand and mulch. The vegetables look great. My yard is not fenced in so we will probably put a fence around the garden to keep the critters out. I like your ideas about using newspaper to control weeds and using vinegar to kill weeds I am going to try them both along my sidewalk. I use this every spring on the raised veg and herb beds. I am disabled and I have found it drastically reduces the work of weeding threw the whole summer. I also leave any veg plant matter on the beds (though I know bugs can hide in them) so they can eventually end up under newspaper again for additional soil food. Any way that I can save from having to do weeding is right up my alley. Someone above mentioned they do it in the fall which I’m thinking is a wonderful idea and I might start that this fall but still do it again in the spring. The recycle trucks never get my newsprint or flyers, they are all for my garden. Also I learned from my mother when I was young (a long time ago) to use vinegar. Always a great source of information is anyone who tended a garden before chemicals were widely used or couldn’t afford them. I’m not sure about 5% vinegar (I’m in Canada and perhaps the labelling is different), I’ve never heard of diluted vinegar being sold, however I just use it straight on my gravel driveway and in-between the rocks on the paths in a spray bottle or just dripping it onto the middle of the plant. It is wonderfully effective. Under the bird feeders are the worst for odd growing things and use vinegar once a month there. I very much look forward to your newsletter each Sunday evening, always has something that interests me. I can’t help but think that you are always looking for ways to do things easier since you have so much to do on that property and telling us about it. Thank you. Newspaper has converted my front, back, and side yards into garden (formerly Bermuda grass and weeds). Pick up at my recycle center drop off. I have found the newspaper draws earth worms and turns the soil into a consistency of coffee grounds when you leave it a year (layers of 12-20 sections of newspapers). 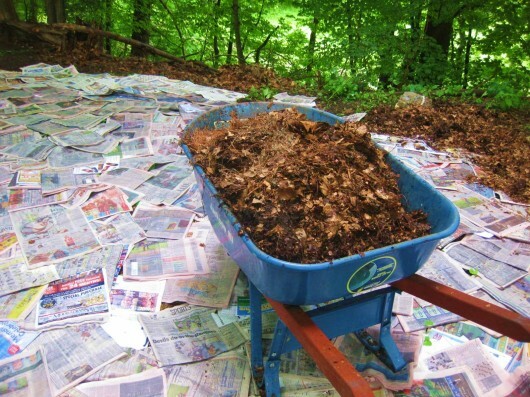 Have used cotton seed hulls, pecan hulls, cow manure/mushroom compost, and grass clippings on top of the newspaper as mulch. All work fine. I like the pecan hulls for long term (slower breaking down and attractive). Use corn meal from the grocery store as a weed preventive and fertilizer (spring and fall). Virtually have no weeds. Prevent weed seeds from sprouting. Start all my seeds in a greenhouse. Corn Gluten Meal is the preferred weed preventive and fertilizer. In my opinion, corn gluten meal is too costly and corn meal works just as well. My tomatoes produce twice as much as normal and the plants are very healthy. Corn meal is the best fertilizer I have ever used. I don’t like weeds. Vinegar changes the composition of the soil (not all good). Have found you must use commercial 20% vinegar to actually kill the weeds (purchase from Marshall Grain Company). Hi Kevin, I also use newspaper – if you aren’t having success with it perhaps you are not getting it thick enough. I save papers all winter to smother weeds. I put 3″ of paper around my flowers and then add about 2′ of wood chips. Works great and looks very well groomed! As for the vinegar you have to use it full strength on a very sunny hot day. Really works! Thanks for all the useful info. I grow intensively, planted close together, well fertilized, the vegetables shade the soil and I have very few weeds, almost no weeding in my half acre garden. I’ve been using newspapers on weeds for years. Last year we bought a house on about 1 acre. As always, no one had done anything for this poor place…goat heads over the whole place plus weeds that I can not even name. So I have been begging grass clippings and bags of leaves on FreeCycle and from neighbors so I can cover up the newspapers on the weeds. Since I have so much to do, I am also using old carpet and a roll of plastic that is 10’x100′. With our hot sun, it cooks the weeds but the grass is another situation (gotta get the vinegar out). Renate, I think the key to using newspaper is you want it at least 5 sheets thick. I often use newspaper in the garden but it always attracts slugs! Any idea on taking advantage of this method with inviting the slimy slugs? Thanks! The violet’s and creeping charlie grew right threw it. Ugh. But I have a question… [actually two] – right after laying down the newspaper and topping with about three inches of mulch those biggish black carpenter ants moved right in, building their fortress right under my chair!!! Are there any preferred methods to keep them away? I’m not the kind to poison, because my dogs have access to the area, but I’d like them to either die, or relocate. Heh. Question number two – would this method work with an area that is currently riddled with… [dun dun dunnnn!] … Ragweed? I have been using newspapers for years to cover the ground under the vining summer squash’s to keep the squash off the ground. End of season, the paper, what is left, gets turned under in the raised beds. Remember, if it comes from the earth, it can go back into the earth. If newspaper mulching isn’t working, you probably aren’t laying it thick enough. 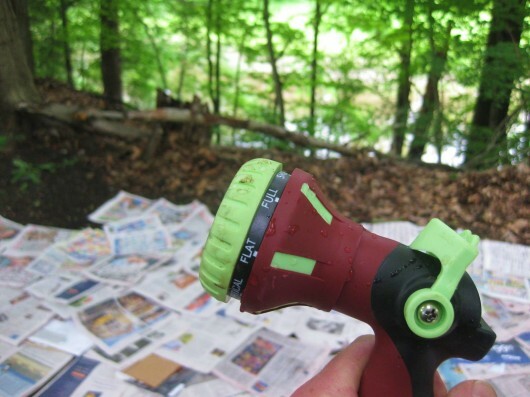 I choked out a poison-ivy infested area with this method, and it worked great. I sprayed the area with weed killer (I know, I know. It’s bad – but so is poison ivy!!!) and laid newspaper – about 15 layers or more on top, then mulched heavily with a more attactive shredded bark. It looked much better. I did wait till the next year to plant anything there – just to be safe – but the poison ivy never came back. I had tried just weed killer in the past, and it was only a short term fix. This double attack wiped it out completely. I wonder about shredded paper from my office? Does anyone know if laser jet ink is safe? Stopping by your site is always such a nice respite. I use newspaper in the veggie garden and it is great. At this point I wouldn’t even mind if a weed broke through if it sprouted out of our governor’s head. ( I remember Barbara Kingsolver enjoying a similar pleasure in Animal Veg Miracle). badger gardener – Believe me, I achieved much satisfaction from shoveling mulch over the face of certain politicians! I am new to planting, and a lot of my plants were given to me so not really informed on them as much as I would like to be. Anyways I was wanting to try this idea for my weed problem, but I was told some of my plants would spread eventually, would the newspaper prevent them from spreading? Kevin, I also use cardboard boxes for especially troublesome areas. How can we kill ants without harming him? Have a question? My vegetables are all ready growing? Can I still put newspaper around them and then cover with mulch. Also can this be done for okra and squash? My tomatoes are about up to my knees. 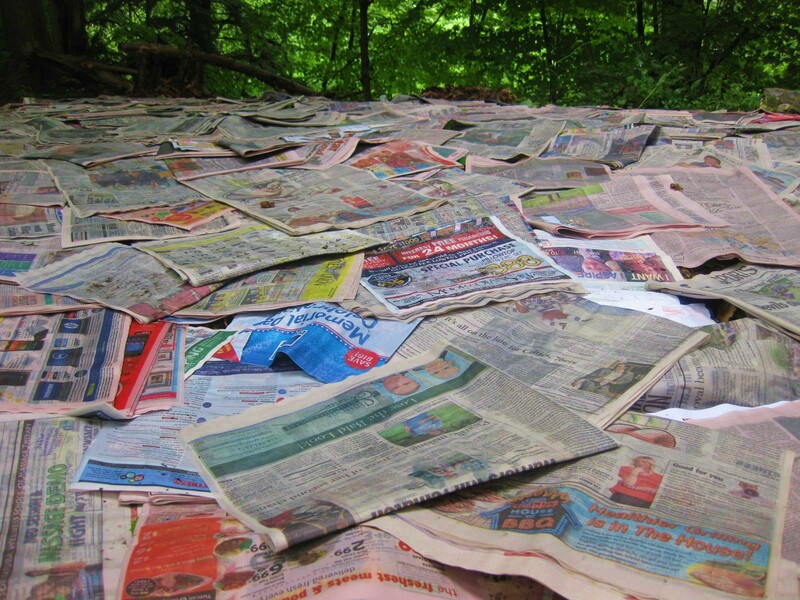 Jason -Yes, you can use newspapers to smother weeds in your already-growing veggie garden. First, water your vegetables well. Next, lay the newspapers down, and saturate them with water. Finally, apply a layer of mulch. Newspaper is porous — it won’t interfere with water reaching your plants’ roots. And you shouldn’t have to pull a single weed from your veggie beds for the rest of the season. Great tips for those of us on a tight budget! Can I use grass clippings as a mulch? I have St. Augustine grass here in South Florida and we have our lawn treated every other month. The weeds in our grass are very little, so I was wandering if any of the mulch from the weeds in the grass would defeat the purpose of regular mulch? I laid down newspaper covered with chopped leaves on my 3 month old annual cutting garden and immediately had a new problem – slugs. Hundreds of them! I decided I’d rather weed and water more often than pick slugs by flashlight every night, so I picked it all up and now – no slugs! They were hiding during the day under the newspaper. Would the leaves alone have been as inviting to them? We have used garden fabric in flower beds in the same way. Cultivate, lay down fabric, cut holes in it for plants, then cover unplanted areas with mulch. It lasts longer (several years) than newspaper, but does also let in water. Does not biodegrade, but that is the point, it lasts over a number of seasons before wearing out. I intend to use your very cool newspaper mulch plan. I have long narrow strips of ground, about 3` wide along beside concrete patios and such. But my plan is to lay down a layer of lava rock on top. My question to you is, should I lay garden fabric on top of the newspaper first, or can I lay the lava rock directly on the newspaper ? What would you do ? Can I put down newspaper, get it wet and NOT put down mulch? I just moved into a place and they put a ton of wood chips in the flower beds and now weeds are growing through. How long does it take to break down? Hi JLP – I know this is work you’d love to avoid, but…it’s best to rake out the wood chips in your flower beds. Don’t worry about getting all of them out — just most of them. Then lay down a thick layer of newspaper, and top with the chips. Depending on how thick your newspaper covering is, it will smother your weeds for at least one season. I say “at least,” because I have beds that were newspaper-mulched 2 years ago, and I’ve yet to see a weed push up through the paper. Great tips for week control- and recycling! GUYS, THE INK IN THE NEWSPAPERS ARE FLORMALDAHYDE(SP?) BASED. USE NON INKED PAPER. THIS IS ALSO THE BEST FOR EARTHWORMS. I’ve done this before with grest success, but would warn people of one thing. NEVER use the comic sections as mulch. I did this once and it made my plants grow funny. LOL! 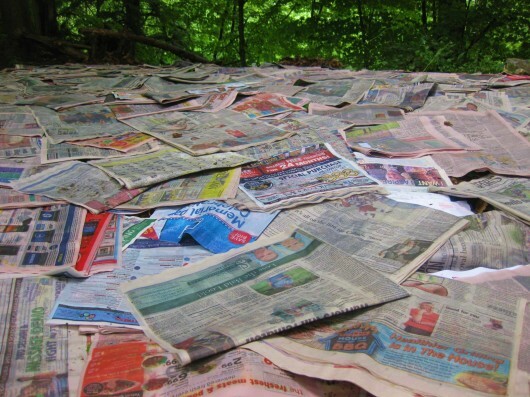 If you want to keep Monsanto and GMOs out of your garden don’t use newspapers. Almost all newspapers are printed with soy based inks and almost all soy is from genetically modified seed from Monsanto. It’s getting harder to avoid GMOs as Monsanto crops are incorporated into more and more products. By the way – other inks used by some newspapers are usually petroleum based and used to contain lead. Also be aware that printing inks can contain metals, especially the colored inks. I Know the amounts are tiny but I try to grow organic as much as possible and never knowingly use Monsanto products, so I’ll pass on the newspaper idea. I layed down newspaper and cardboard last fall and plan on dumping compost right on the 3′ of snow we still have up here in N.W. Wisc. (Birchwood) I am using the winter sowing method as is my sister and brother-we are excited for the results! I got such a kick out of Badgergardener’s govenor comment-right on! Love your site and have told many gardener friends about it. Wanted to add my thumbs up to this technique, using carboard boxes. In my experience the boxes work much better than newspapers. Ten years ago we moved to a house in a ‘designated ravine’, where there were severe restrictions on what we could plant, use for weed control, etc… It had been an estate sale, thus completely overgrown with invasives (that I didn’t know were invasives at the time!). Our land is steeply sloped – with one ‘flatish’ section where the house is located. 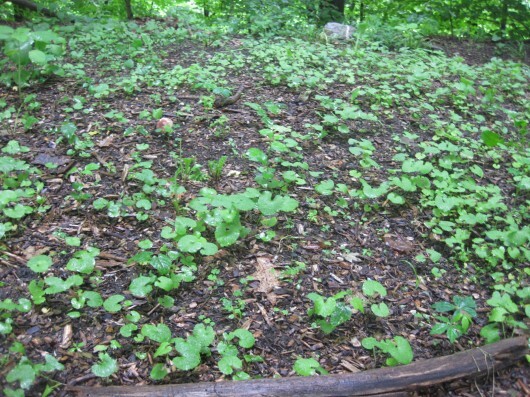 The soil is loose and sandy – easy for invasive plants to take root and spread. I spent two years fruitlessly trying to weed by hand (and keep myself upright on that slope!). That only ever seemed to make things worse! Then I spent two years trying to use the newspaper technique. It helped a bit, but not for long in our loose sandy soil, and the weeds seemed to come back stronger than ever the next spring. Then, after helping someone move, I tried the same approach with cardboard using the leftover boxes. Voila!!! It worked like a charm! It was SO much easier – particularly if you’re working on a steep slope. It didn’t blow around, or at worst only needed one temporary ‘peg’ per sheet (just make a slit in the cardboard and use a stick to peg it down). It was so fast and easy to lay down, and using large sheets of cardboard (large boxes opend up) meant that I could reach difficult to reach places with relative ease. It was heavy enough that I could wait to soak it down until I’d covered a whole area. Plus, I didn’t have to worry about what was in the ink. Best thing, though, is that I’ve had no problems with those weeds ever since using the cardboard only the one time (5 years now). I can’t tell you how relieved I felt to realize that I no longer had to scramble around on those steep slopes, trying to keep the newspaper from blowing down the hill while trying to keep my balance! Do you think asparagus mulched with newspaper in the fall would break through in the spring? Hi Gerry – I’d lay newspaper (or cardboard) around the asparagus-patch, but not directly on top of the plants. Used this trick today between my garden rows. I love the no dig easier way of doing things! I used cardboard under the soil of my raised beds and the worms just love it! Thanks for reposting this because I almost forgot the newspaper under my mulch today and your email came just in time! My vegetable garden has weeds and grass growing in it like crazy. There is no way I could hand pick these weeds. If I go and lay newspaper down can I cover it with straw in place of grass clippings? We have lots of straw because I use it in my chicken coops. You have a great website, very informative. I am utilizing your newspaper mulch idea today for my tomato & vegetable gardens. Thanks for a great tip! I tried this for the first time this year. What a mess! The birds or other critters keep digging through the mulch and tearing up the newspaper! I didn’t get finish all the garden beds with it, but not sure I really want to continue. What did I do wrong?? Two people have asked if bulbs will come up through the newspaper mulch, but I don’t see an answer. I have an area I have mulched before with wood mulch, but grass keeps coming up there. I want to plant bulbs there now, and put newspaper layers down on top of the grass to kill it. Will the bulbs come up through the newspaper? There are too many bulbs to put newpaper mulch down first, then cut through to plant each bulb. I want to dig trenches or large holes to plant groups of bulbs, so need to do this first, with the newspaper layers on top. Hi Sharon – Newspaper (or cardboard) is a terrific weed barrier. But I would not use it atop a bed of bulbs. The material would likely interfere with the bulbs’ emerging shoots. Thank you!! I kept reading color newpapers bad it makes since to see someone say it. I found your article very interesting and a good source for my research on organic weed control. I normally use grass trimmings as my mulch which works fairly well. foliage if used elsewhere in the garden. Currently, my lawn is full of weeds, and I want to have it re-done by myself. I’m planning on putting six layers of newspapers plus cardboard to kill the weeds, later this Fall (as early as first week of November). Will tell you all about it once I’m done. I LOVE your idea. No more throwing away flyers into recycling. I will recycle it in my own way AND get revenge on something I simply loathe!! I also love your sense of humor – “a big wind will kick up just as you start to work”…hahaha. Thanks for the great tip! You say: I don’t worry about black-print versus colored-print. Why? Because these days, all newspapers use non-toxic pigments. Even the glossy pages are coated with a non-toxic, biodegradable material. it says: Again, use only newspaper or paper with non-toxic inks (no glossy magazines). A suggestion for those of you concerned about newspaper inks. We purchased “end rolls” from our local newspaper. They were very inexpensive and quite a bit of unprinted paper left on the rolls. Had paper left after doing all my raised beds. I’d like to know where you live because in St. Louis this doesn’t work at all. I put down newspaper and thick leaf mulch five months ago and the smashed down grass under it is still green and the newspaper is still intact, wet but not decomposed at all. Completely disappointing after that huge amount of work. Thank you for sharing this helpful idea. I have two flower bed areas in my back yard, one has no plants (just weeds and grass) and the other has a couple of plants already in the ground but there is grass and weeds growing up around it. I am going to try the soil solarization method on the flower bed that doesn’t have any plants yet but for the one that does have some plants, I can’t use that method (or it would kill the plants). The flower bed that has a couple of plants in it, there is a lot of space left for more flowers or shrubs to be planted but I don’t want to plant yet until the weeds and grass are gone. I see in your diagram that you are supposed to put the news paper around the plants, water, and then mulch. What would be your advice to someone like me that hasn’t planted yet but needs to remove the weeds? Am I able to lay the newspaper down, water it, and let it be (don’t put mulch on top) so that it can do its work but then I can come back and plant afterwards? If so how do I go about that so the newspaper stays put? Any help would be greatly appreciated! Hi Chelsea – Good news for you: Once you’ve put the (wet) newspaper and mulch down, you can plant right through the newspaper. Just cut holes as needed!